In today’s world of hurricanes and unexpected storms, unruly trees and tree branches can become a big problem quickly. You can mitigate this issue without spending a ton of extra money on a tree trimming service if you invest in a solid pole saw. Read on to learn more about these exciting tools. A pole saw is a type of saw that attaches (or is fused to) a longer pole. 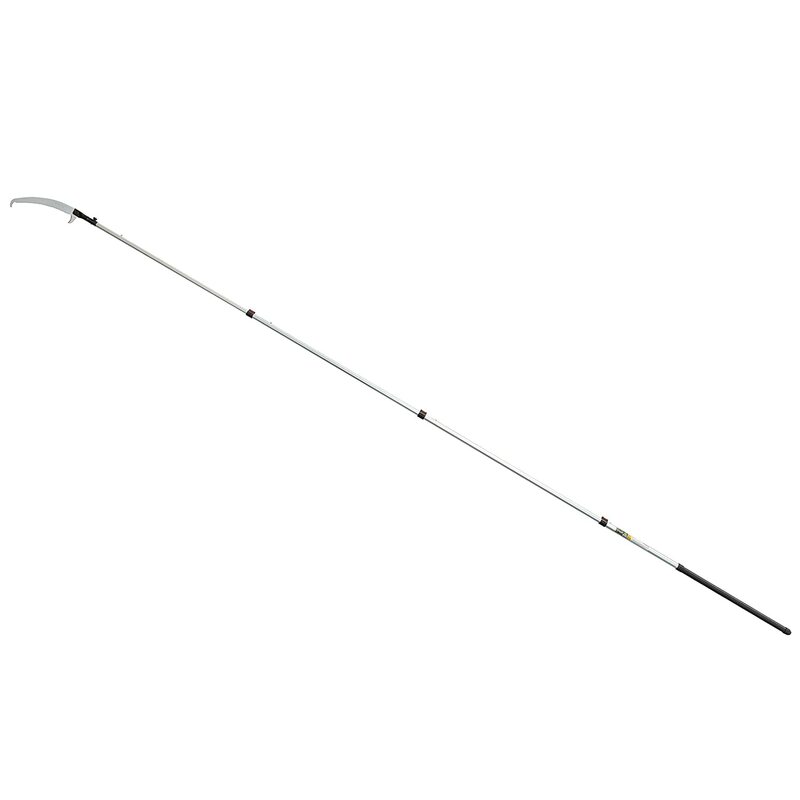 This pole can typically be extended or retracted to varying lengths. 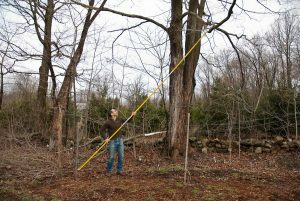 A pole saw is ideal for cutting tree branches on tall trees that would typically require a ladder or even a cherry picker to get to. Pole saws can vary in their length when fully extended, and length can also impact saw steadiness and ease of use. If you know you are not going to be dealing with super tall trees, you may want to go with a shorter saw so you have more control. On the other hand, if you are working with really tall trees, you definitely want a saw that can reach all the way up there. Pole saws can be powered by a variety of sources, including gas, electricity, or batteries. You should take into consideration what power source will work best for you – for example, if you foresee taking this saw far away from an electrical outlet, battery power would probably work the best. No matter all of the fancy bells and whistles a pole saw may come with, there is no avoiding the fact that you still are going to need to hold it for an extended period of time to cut through tree limbs. Make sure you find yourself a saw you will be able to hold for a long time without wearing yourself out. 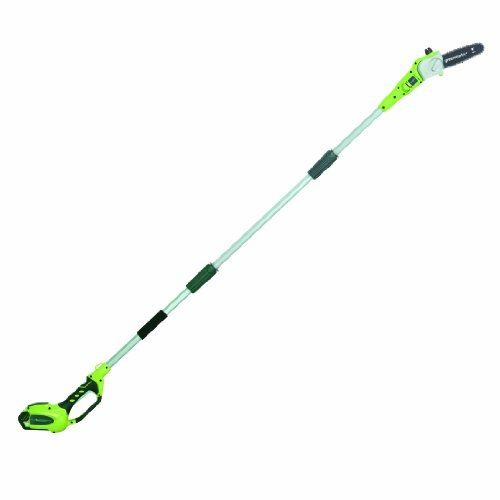 The Greenworks 8.5’ 40V Cordless Pole Saw is a fantastic pole saw that will be able to get any sort of job you need completely done. It is easy to assemble, and does not require any tools for its initial setup. In fact, pretty much everything about using this saw is easy – it is easy to check and refill the oil levels, it is easy to clean and wipe down after you are done using it, it is just straight up easy to use at all. But do not think its ease of use means it is in any way less capable than any other sort of pole saw. Far from it! This saw can reach up to super high tree limbs, fifteen feet above users’ heads, according to some reports. It has a great feel and balance so you do not feel unsafe in the slightest while you are operating this saw. It quickly and efficiently saws through anything you put in front of it. If you are looking for the ideal pole saw, you will have found it in the Greenworks 8.5’ 40V Cordless Pole Saw. The Greenworks 8.5’ 40V Cordless Pole Saw is pretty much perfect when it comes to pole saws. The only part of this saw that is not straightforward to use is the battery release mechanism. 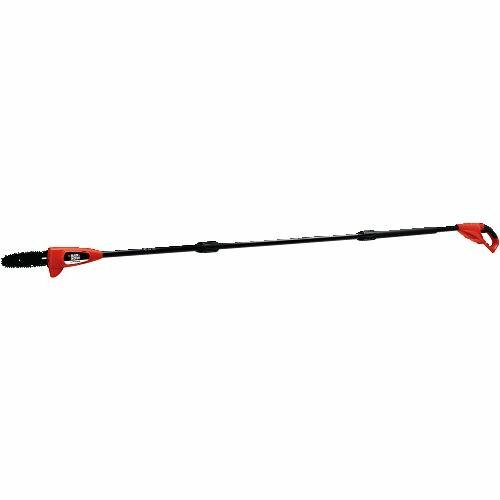 The Sun Joe SWJ800E Electric Pole Chain Saw is a fantastic electric pole saw that will change your world after your first time using it. It is specifically designed to be an extendable chain saw, not like many of the other competitor pole saw brands that are just regular chain saws attached at the end of a pole, which you can then detach and use as a straight up chain saw. Because of the design of this saw for a very specific use, it is much lighter than other pole saws, making it easy to maneuver and get into hard to reach places. Also, the extension pole is far more rigid than competitor brands, and users report they do not experience any wobbling even when the saw is fully extended. It is difficult to think of a saw safer than that. But just because it is on the lighter side does not mean there is a compromise on ability – this saw can chomp through branches with the best of them! 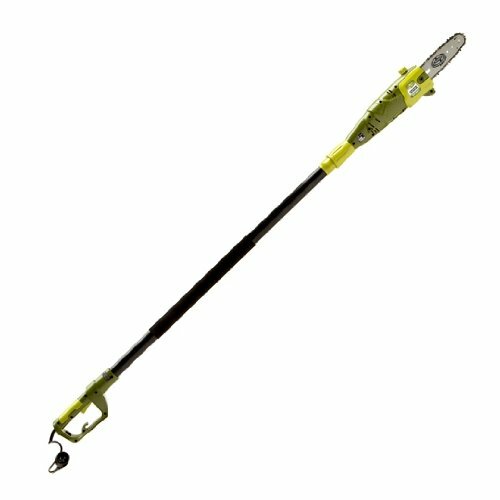 The Sun Joe SWJ800E Electric Pole Chain Saw is a great electric pole saw that is specifically designed for extension cutting. Just make sure you have a supply of oil on hand, because this bad boy burns through it pretty fast. We mentioned it above, and we will reinforce it again: the Greenworks 8.5’ 40V Cordless Pole Saw is a pretty fantastic pole saw. Its cordless feature really makes it ideal in terms of transporting it, as you will never ever have to worry about making sure you are near an outlet or you have brought along a generator. The lack of a cord also means it can cut at any angle and be manipulated into weird, tight crevices without worrying about the cord getting tangled and the saw becoming permanently stuck. Cordless pole saws open up a whole wide world of possibilities, and the Greenworks 8.5’ 40V Cordless Pole Saw is the best way to explore all the possibilities imaginable. If you are looking for an awesome cordless pole saw, the Greenworks 8.5’ 40V Cordless Pole Saw is the absolute best choice. Just know, as mentioned above, that the battery release mechanism is a little difficult to operate. RThe TrimmerPlus TPP720 8” Polesaw with Bar and Chain Attachment is an awesome gas powered pole saw that will always come through when you need it. This saw is ideal for yard maintenance, particularly as it is a lot less loud than some of the other competitor saw brands. It is safe and accessible for anyone to use, even those users who may not have much pole saw or chain saw experience. It is made of high quality material, so you know it will last you a long time. But do not think for a second that this durability will cause this saw to be heavy, bulky, or difficult to maneuver – quite the contrary. This saw is light and easy to carry, yet still chomps through any wood you put in front of it. The Silky New Professional Series Pole Saw is one of the most impressive pole saws on this entire list. Yes, it is manual, but do not be thinking you will need to exert massive amounts of time and effort in order to get this saw moving enough to get the job done. The teeth on this saw blade are so sharp that you really do not have to exert any sort of extra effort or pressure to saw through wood branches, even when the saw is fully extended to its maximum length. The angle of the saw is also well designed so that it makes quick and easy cuts. It can chomp through pretty much any kind of wood you put in front of it, and because it is manual, it will save you gas and battery costs. There is not much to dislike about the Silky New Professional Series Pole Saw. The Silky New Professional Series Pole Saw is a great manual pole saw that you can use without a huge amount of time and effort. Just watch the saw bolts and make sure you tighten them whenever they come loose. The BLACK + DECKER LPP120B Bare Max Pole Pruning Saw is an awesome pole saw for the money. You get a lot of bang for your buck with this saw! It comes with a battery pack, a battery charger, an Allen wrench for adjusting the chain, a bottle for oiling the chain, a storage bag, and a scabbard to cover the saw when storing and transporting it (the scabbard also has a slot to store the Allen wrench and a strap to hold the oil bottle so you can keep the whole thing together easily). Just because this saw is on the cheaper side does not mean you are compromising on ability – this saw can reach up to fourteen feet and chomp through some tough branches! The whole thing is quite easy to use, from initial assembly to adjusting the chain, and best of all, it is also easy to store away. This saw is basically ideal for homeowners who do not anticipate needing to use it all the time. The BLACK + DECKER LPP120B Bare Max Pole Pruning Saw is pretty much the best pole saw for the money that you will be able to find. It does have some inconvenience issues, such as the need to manually oil the chain, though. We have all heard of the high quality and just general awesomeness of the Stihl brand – but how do you know which one of their many incredible saws to go with? In our opinion, you can’t get better than the Stihl HT HT 56 C-E Pole Pruners. This saw can handle anything you throw at it, and last for hours and hours of heavy use. It also has a number of awesome convenience aspects, such as the ability to come apart into two separate sections, which makes it super easy both to transport and to store. Another great feature is the included shoulder strap, which takes some weight off the user when you are holding it for extended periods of time. Best of all, this saw can cut through anything and everything, as consistently as a hot knife through butter. You know you are getting a good saw when you go with the Stihl brand, and you know you are getting a great saw when you go with the Stihl HT HT 56 C-E Pole Pruners. The Stihl HT HT 56 C-E Pole Pruners is a fantastic saw from the well respected Stihl brand, so you know you are making a great choice when you go with this product. It is a little shorter than some of the other saws on this list, so you may want to use it on smaller trees. Cordless pole saws are powered by batteries, meaning you do not have to anywhere near an electrical outlet to operate them and they also tend to be significantly lighter than gas saws, which need to have gas tanks attached to their motors. The one inconvenience with cordless pole saws is that you will likely need to change out their batteries fairly often. Gas pole saws, as mentioned above, are heavier than cordless pole saws because they have an attached gas tank. However, these saws are often the most powerful of all the pole saws, so if you want a saw that will get any job done, a gas saw may be the choice for you. Manual pole saws are not powered by anything except human strength. These saws are typically the lightest out of all of the saws, because they need neither a battery pack nor a gas tank nor any kind of motor at all. It is more tiring to use these saws, though often they are designed in such a way that the weight of the saw ends up doing the majority of the work if it is balanced properly on the tree branch. If you are a homeowner and you have trees on your property that are taller than you are, odds are you are going to need to trim them one day. And trimming trees is never easier than when using a pole saw. Keep in mind the different kinds of power sources you want to use with pole saws, and the length of your ideal pole saw. Everyone has different tree trimming needs, but a pole saw can really make the difference between thousands of dollars spent on a tree trimming service and a quick job that can be completed in just a few hours.